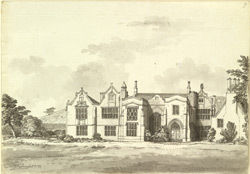 In 1709 Abraham Elton (Elden), a wealthy Bristol merchant, purchased Clevedon Court and the accompanying estate. The house, which was built in the 14th century and extended in the Elizabethan period, previously belonged to the Wake family of Northamptonshire. Abraham Elton was an influential local figure: he was sheriff of Bristol in 1702, Mayor in 1710 and later became MP for Bristol and was made a Baronet.